Disney's Seven Dwarfs Mine Train starts coasting, but who's getting taken for a ride? September 23, 2013, 3:49 PM · The Seven Dwarfs Mine Train roller coaster, under construction at Walt Disney World's Magic Kingdom, is now coasting. Disney Imagineers conducted their first "drop test" of the family coaster that will complete the Magic Kingdom's "New Fantasyland" when it opens in the spring. One of the coaster trains dropped from the ride's station and ran under its own gravity-powered momentum. This is the latest droplet of information about the ride to trickle from Disney World's PR team over the past months. Each press release and blog post build anticipation for a new attraction. (Or, at least, its publisher hopes that it does. If not, what's the point?) But what happens when too many press releases build anticipation beyond the level a new ride or show can deliver? That's a risk that PR professionals ought to consider when promoting a new attraction. How would the public have reacted to last summer's Antarctica: Empire of the Penguin attraction at SeaWorld Orlando had that park not promoted it with so many YouTube videos and concept illustrations? Would word-of-mouth from initial riders have been better if they'd had no expectations about the attraction? Would more positive reaction from early riders delivered more visitors to SeaWorld over the ride's first 12 months than a massive publicity burst, especially if that publicity left some visitors with unmet expectations? Disney's decision to build New Fantasyland in phases, with its centerpiece — the Mine Train — opening last, inevitably raises the attention paid to this ride. We've been talking about it for years now, and following its construction for many months. But there's little in the specs for this ride that suggests it will be anything more than a "D"-ticket level attraction: A nice, solid addition to the park, but not a leading destination that alone convinces potential visitors to book a trip. What do you think? Is Disney overhyping the Seven Dwarfs Mine Train? Or are people who read these releases (either here or through Disney's social media) savvy enough to see through the hype? What are your expectations for the final piece of the New Fantasyland? September 23, 2013 at 4:00 PM · I think it is fine. I do not think this will be a D attraction. New Fantasyland has caused many more people to come anyway. September 23, 2013 at 4:34 PM · Here we go again. The audience for this attraction, and 'Under the Sea: Journey of the Little Mermaid,' and 'Enchanted Tales with Belle,' and 'Dumbo the Flying Elephant,' and 'The Many Adventures of Winnie the Pooh,' and 'Peter Pan's Flight,' and 'Princess Fairytale Hall' and 'It's a Small World' and 'Prince Charming Regal Carousel' and 'Mickey's PhilharMagic' and 'Goofy's Barnstormer' are family's with small children. My expectations for "the final piece of the New Fantasyland" are that it will complete what may very well be the most successful collection family-oriented attractions in themed entertainment history. September 23, 2013 at 4:37 PM · In my opinion, even though the dwarves mine train is much smaller than the other mountains and that it is in fantasy land, I still think guests will expect a ride experience similar to Big Thunder rather than like Goofy's coaster. Simply for the fact that it's a mountain and since all Disney worlds other mountains are E ticket, it's easy to expect this one to be of the same caliber. Even I have to keep my expectations low because I keep thinking it's going to be a big thunder equivalent when clearly it's not. I am just hoping that the show elements inside are substantial enough to add to the experience so that it gives the illusion of a more exciting ride. On the other hand, if the experience is on par with Goofy, then the demand to ride may lessen thus reducing insanely long lines and crowds gathering around the mountain and congesting fantasy land. September 23, 2013 at 4:53 PM · Overall, I think Disney is doing a better job with this than Seaworld parks did with the penguins. Granted, Disney has an advantage in that people expect family friendly coasters from them and they don't have many 'extreme' coasters. Honestly, I was more disappointed with Busch Gardens Tampa over Cheetah Hunt than the penguins at Seaworld. Seaworld has more kid rides and they didn't push speed or anything like that. They pushed more for being an immersive environment. I don't know if they succeeded because it was down the only time I went and they just walked us through the ride section and we just got to see the penguins which was pretty much all I was interested in anyway. September 23, 2013 at 5:28 PM · If the quality of the ride corresponded to how long it took to construct it, then the Mine Train coaster would be the best ride at WDW. I'm not sure how anyone can think this ride will be an E-ticket. Just because you want it to be, doesn't make it so. There's nothing to suggest it's a "major" attraction -- it's rumored to have one show scene, about a 2-minute ride time. As for the commenter who said MK's Fantasyland has the best collection of family-oriented rides, I'd point them to Disneyland's Fantasyland which is far superior. New Fantasyland may have been the "largest expansion in MK history," as the PR materials put it, but there's no question it's underwhelming to any guests visiting without toddlers. September 23, 2013 at 5:51 PM · I think anyone expecting an E ticket thrill coaster themed around the fairest, most soprano, most demure princess of them all and situated right across from Belle's house and where you go meet Cinderella and ride carousel horsies--just because it has a mountain surrounding the ride structure--isn't necessarily using all of their brain parts. New Fantasyland isn't the place for a Mountain-level coaster, which may be why it is called a mine train, not With A Smile And A Song Mountain. September 23, 2013 at 6:00 PM · Yes you can and will over sell a product the way Disney is doing. This happens in the game industry for years and I guess due to the lack of new attractions stuff to show even the toilets get their own endless slew of blog posts on the official Disney blog site. Does it disappoint? No, you can do a number 1 and 2. The only thing that is missing is a ride photo and a hug section to say farewell to your former donut. I think the Dwarf coaster is going to be a fun little ride with about 4 minutes of ride time and handling rate of about 1000 guests/hour (with 3 trains on the track). Take in consideration Magic fastpass Plus (or how it's called) and the wait times are going to be horrendous. Where the Goofy coaster is themed crappy, has no dark ride part and no wiggling cars the mine train has that all and adults and kids, hunger for finally something new at WDW, want to ride it. I think Disney just build a new problem. Although I think guests will like the ride the wait time will leave a nasty aftertaste. September 23, 2013 at 6:08 PM · I'm gonna go out on a limb here and agree with both Robert and TH. Like TH, I believe that the core audience for this ride -- families with children -- will love it and it will not be a disappointment. However, I also agree with Robert that it's taken waaaaaaay too darn long to build the thing, and too much hype has gone along with that... I mean, Universal built a fully-realized Hogsmeade in what seemed like half the time it's taken to build the mine train.... and whether that is true or not, it certainly only took Universal about 9 months to bring Transformers in Orlando from speculation to reality. And that's kinda my point... I'm really looking forward to the mine coaster -- especially if it really is a slightly-less-than-Thunder-Mountain-coaster-with-dark-ride-elements, which I'm hoping for -- but it seems like it's been in construction forEVER! I don't get to Disney that often -- honestly, I just can't take the artificial atmosphere enough to go more than once every two years or so -- but that being said, I have a trip planned there in December....and if the Mine Train had been on a construction schedule similar to the sort of thing Universal is doing, it would be done by then, as opposed to me having to plan ANOTHER trip in 2014 to get to see the thing. I just don't understand why Disney can't fast-track this sort of "cool ride" instead of spending its time building princess meet-and-great areas and restaurants. Especially if it's going to hype the ride into something special. Why not go ahead and get it out there? September 23, 2013 at 6:27 PM · Robert, I usually agree with you spot-on...but we are on two very different pages on this. First, the Mine Train is not supposed to be a big, exciting, mind-blowing ride. I've never seen Disney herald it as an E ticket or a major attraction. I think the ride looks charming, and from the models and illustrations I've seen the mountain and trees that will surround the ride will make New Fantasyland look really enchanting. All of that kinetic energy of the trains moving around...it's going to be fun to watch and make the area seem lively. I think it's a definite step up from the old Snow White's Scary Adventures and I am looking forward to this ride. I'm someone who can't handle the really big coasters, and to be honest Big Thunder Mountain is a little too much for me. This Mine Train looks right up my alley though. On the top of Antarctica, one thing you don't mention in your article is that Sea World pretty much lied to guests with that concept art. The ride they showed in concept art was amazing and gorgeous...but that is not what they actually built at all. If you recall, in the concept art they showed those trackless vehicles moving around, right up next to penguins...and all of the interior scenes of the right were just downright gorgeous. They really lied, because the actual ride they built is cheap looking and junky. And it does not involve riding those vehicles by live penguins the way it depicted in the concept art. I think that's why people are so disappointed...because Sea World made the mistake of showing BlueSky drawings of an attraction that was nothing like the pictures. Disney's never done this with the Mine Train ride. We're getting exactly what the concept art showed on this one. I also have another take on the "Fantasyland opening in phases" thing. This is another instance of Disney being damned if it does and damned if it doesn't...because if it had opened the entire land at once then people would be griping that it was not impressive enough and it would have been compared directly to Wizarding World. Disney did not do this project as a "Potter Swatter", but if it had opened up the entire thing at once the media would have tried to write that story. This was just a much-needed expansion of Fantasyland that mainly brought some of the classic movies from the 90s into the park in attraction form...and reinvented Snow White's presence. There are no attractions in this that Disney is trumpeting as massive game-changers...they are just nice additions for guests who love the Fantasyland characters. I'm really looking forward to spending some time in Fantasyland forest. I think it's going to be beautiful. But I am not someone looking for a big E-ticket. I don't think every addition has to be an E-ticket. I think the Star Wars expansion at DHS is going to be the big, massive, jaw-dropping construction project. New Fantasyland was never meant to be or marketed as that. September 23, 2013 at 6:43 PM · I think there's no way not to over hype this ride like you mention. Like another commenter said, the big issue is the time that it's taken to build the attraction. If it had arrived with the majority of New Fantasyland, it would have been part of a package. I think the phased approach is the main issue. The other reason so many are focused on this coaster is that Disney has been dragging their feet in Orlando. There have been few new attractions at the other three parks. Fans like me who love those parks can't help but hope this attraction is great. That said, I'm keeping my expectations in check. It will likely be impressive and have good theming,but it's unlikely to be on par with the mountains. Thrill Junkies with no preference for family friendliness in their attractions will think it is disappointing. Those who are attending the park with their families who crave something they can all do together will like it. The ones who hate it should have just went to a thrill park to begin with. September 23, 2013 at 9:14 PM · I'm glad that the park honored Walt's original vision of an area themed to a bright tacky circus carnival, its the reason he built the park. Adding live clowns to it is the Disney magic at its best. This is what sets Disney apart from Universal. September 24, 2013 at 12:50 AM · I don't think anybody expects this to be more than a good ride that's part of a MK refurb that's much needed after stuff like Stitch and Laugh Factory. It's not going to bring in guests like Diagon Alley and the Gringott's coaster, the latter should make Seven Dwarves look like a Wacky Worm and took half as much time to design and build. The WWOHP opened in 2010 while I remember a Seven Dwarfs mine ride and New Fantasyland being rumored back in 2008. September 24, 2013 at 2:30 AM · One of the commenters said something sarcastic about Walt not wanting a "tacky circus" area in his parks. You don't know much about Disneyland history, my friend. Because Walt Disney indeed did try to have a circus at Disneyland. It was a flop, but it's one of the things he tried to put in there, off Main Street. I think it's always dangerous to invoke the ghost of Walt Disney and declare what he would or would not have wanted. The man has been dead for 50 years now...but when he was alive Walt would dream up all sorts of things that he believed families would like to do together. I think the Mine Train ride is something Walt would have personally loved. As for how long New Fantasyland is taking to build, well do you have any concept of how long the Haunted Mansion at Disneyland took to build? Or how long it took for Fantasyland to be completed at Disneyland the way Walt wanted it? None of us are really privy to the internal discussions that drive Disney's projects. The construction happening in phases seems to have been so that they didn't have to close off Fantasyland to guests while the construction was happening and they rushed to get the Dumbo area open first so guests would be able to enjoy that while other things came online when they could. September 24, 2013 at 2:37 AM · I'm still amazed on what a pass Universal gets from theme park fans. No one ever mentions that in the Wizarding World, Universal just repurposed two existing steel coasters and minimally rethemed them to Harry Potter. But, they left all of that steel exactly as is and cheaped-out on doing anything at all to make those two coasters really blend with the surrounding Harry Potter theming. I'm a pretty big fan of the books and Harry Potter movies, but I don't remember seeing any exposed steel tracks looping around near Hogwarts. This is part of Universal's "good enough" attitude toward construction that gets overlooked by a lot of theme park fans...and I've never understood why they get a pass on that. I love 80% of what Universal did with Harry Potter, but in addition to those two coasters being minimally rethemed there's the issue of standing inside Hogsmeade and looking out through the portals and seeing the Lost Continent area right out there. Really takes you out of the Harry Potter feeling, because Universal has never cared about sightlines. But, Universal gets a pass on that, of course. I just feel like Disney and Universal are judged by two different standards and that Universal is always graded on a curve that purposefully overlooks all the "good enough" stuff that it does. Like, for Disney to get an A-grade out of people it must score 99% on a test while Universal is given an A for getting 75% of something correct. September 24, 2013 at 3:39 AM · Because Annette, who cares if you can The Lost Continent from Wizarding World of a Harry Potter? They are right next to each other. I can see Adventureland from Tomorrowland. I can see Tomorrowland from Fantasyland. I could go on, but you hopefully get my point. It isn't a big deal, and if it was, every theme park would be at fault for letting a guest see another land while in a certain land. It's pretty much unavoidable. September 24, 2013 at 6:15 AM · Robert, I'm curious if you've any knowledge of how well NFE is being received. Reports around the web suggest that the internal visitor feedback surveys have been negative so far - expectations from advertising of a finished product/reality building site in the centre. September 24, 2013 at 7:09 AM · Anonymous poster above said: "If the quality of the ride corresponded to how long it took to construct it, then the Mine Train coaster would be the best ride at WDW." And Flying Turns at Knoebels would be the best ride on the whole darn planet! September 24, 2013 at 7:12 AM · I am a roller coaster nut. Make them fast and make people sick. I love the new Texas Giant and the hyper coasters. That being said, I firmly believe that this is an E ticket item. I do not expect, nor do I need this to be super fast to be great. It is a family coaster. Not all of my family likes fast rides. We can all ride this together. Also, Magic Kingdom is not about the thrill rides, but how to have fun as a child (or inner child). The other thing for coaster fans is that it does something new. I am not aware of any coaster that has the car swing side to side. Further, this mechanism totally is in line with its theme from the movie. It fits everything to be a centerpiece ride: it is appropriately themed, it matches the area where it is set, it does something new, it is a family ride near other family attractions, and it looks fun. I just hope it opens by this coming spring break. September 24, 2013 at 7:18 AM · Great article. I agree that it is hyped too much and should be scaled back- New Fantasyland was a let down when I visited, great ideas and looks beautiful, but it should have been added and expanded with ongoing upgrades. This new attraction looks great, not as big as PR is making it sound. In the comments I see people "defending" Disney, why? We are simply asking about hype and the attraction. WDW needs to raise the bar, make basic upgrades and then move on to larger attractions to compete with other Orlando attractions. September 24, 2013 at 7:21 AM · If it is bad A roller coasters you want, Disney is not where you should be going. For the best immersive theme experience it is THE place. September 24, 2013 at 7:48 AM · Wow, I thought this was going to be a fairly elaborate dark ride with mild coaster elements. I didn't know it was going to just be a kiddie coaster with better scenery. My expectations have just been lowered considerably. I think the original Disney A-E ride designation system needs to be extended a few more letters if this is the case. September 24, 2013 at 9:07 AM · Quick comment: This may mean a lot to some people on this page and cause their expectations to go up or down (because its more of an insider language), but to the average theme park attendee the words "E-ticket" and so on mean very little. They just know its a new attraction. 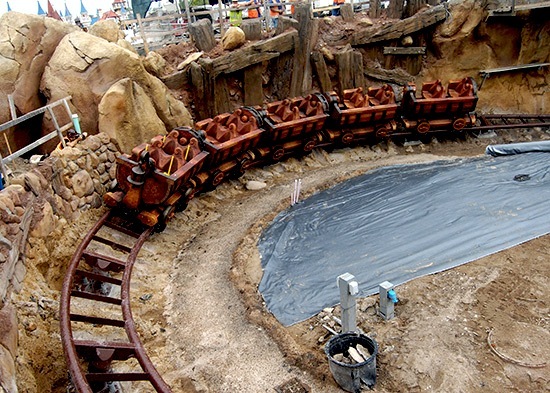 September 24, 2013 at 9:20 AM · Here's my problem with the Mine Train. From what concept art and construction suggests, this will mostly be a coaster with little story. I would have no problem if the storytelling was on the level of or slightly below/above something like Gringotts. As long as the theme is well represented, the ride system could be the worst in the world and I'd still consider it a great experience. If the dark ride portions are few and short, I will consider the ride disappointing. I hope to be wrong once the final product is revealed. September 24, 2013 at 9:27 AM · I think the way they are going about promoting the ride is just fine. I feel that most people go to Disney for the overall experience rather than just the rides. I do feel the mine train coaster is going to be a great addition, but I don't think it is expected to be a momentous addition like Everest was to Animal Kingdom. September 24, 2013 at 9:39 AM · I couldn't agree with you more Robert. I have been following the attraction scene for years now and this over hyping seems to have popped up within the last couple of years. I could be wrong. I don't remember such over exposure by Universal for Harry Potters Forbidden Journey. Sure they had a big press event to announce it and you frequently saw pictures of the show building and Hogsmeade but they ride itself was pretty much a mystery until it opened. What a ride it is! I guess they knew a ride that innovative could stand on its own merit. This is also another close tie between attractions and movies. Generally speaking when the studios spend huge amounts of money to promote films, the films aren't that good. September 24, 2013 at 10:19 AM · When is this thing supposed to open? Is there anything more firm(ish) than early 2014? September 24, 2013 at 10:59 AM · Of course the Dwarfs Mine Train is overhyped. They can't help but overhype it since it is overdue. It was a long time coming and everyone who was disappointed with the New Fastasyland that opened to construction walls still remaining will have an opportunity to be further disappointed when the train ride proves to only be kiddie fare, slowly rocking you to sleep in the new rocking seat. When will it open in 2014? Are we still 6 months away or longer? September 24, 2013 at 2:34 PM · Well, while they have retained the characters and upgraded the ride housing, they have completely lost the story of Snow White. And since it was the one story that Walt spent more time on than any other, and the one that he himself developed and acted out for his animators, I think its a tragedy that they have kicked this story out of Walt's park. Regarding the Dwarf Mine Train, Anon Mouse writes: "They can't help but overhype it since it is overdue." I Respond: "Over due?" When was it supposed to open? The word over due implies the original opening date has already passed. Everything I have read has indicated it will open in the Spring of 2014. If they are doing gravity tests that would put them on schedule. NB asks: "A kiddie coaster an E ticket?" I Respond: Sure. If you are a family with small children it is absolutely an E Ticket. OT writes: "Take in consideration Magic fastpass Plus (or how it's called) and the wait times are going to be horrendous." I Respond: You've got a point there. Keeping little ones patient during a long day at the parks could be a challenge. It will be interesting to see how WDW ops and WDI's design team addressed that concern (i.e. : interactive queue effects, NextGen ride reservations, etc.) The attraction's wait times might also benefit from the shear number of Fantasyland attractions -- Which will reach 17 when you add the Mine Train. That's a lot of ways to spread the crowd. September 24, 2013 at 2:46 PM · Here you go again Robert - you used to be quite 'up' on Disney but this site is becoming more and more like a 'Universal is great, Disney is the dumps' site. They are very different beasts feeding very different markets and I think Annette Forest phrases it perfectly. (See comment above). I don't see Disney as having over hyped this at all - they are just keeping people informed as they go along. I call it good PR - and we can see exactly what is being built so where's the chance to be disappointed? September 24, 2013 at 2:59 PM · Mr. Niles writes: "But there's little in the specs for this ride that suggests it will be anything more than a "D"-ticket level attraction ..."
I Respond: How about a bit of perspective RN ... Do you think "Leah" might regard the Dwarf Mine Train to be an "E-Ticket" attraction? September 24, 2013 at 3:01 PM · How about Miss Gracie? What ticket letter will she give to the ol' Mine Train? September 24, 2013 at 3:59 PM · TH: You lack the ability to read my post. I clearly said "It was a long time coming and everyone who was disappointed with the New Fastasyland that opened to construction walls still remaining..."
"When was it supposed to open?" It WAS supposed to OPEN when the New Fantasyland was opened. The announced opening date for the coaster is irrelevant especially since we still don't know what it is.... Spring TBD 2014.... So disappointing. The ride is late, overdue, based on customer expectations. It is lovely that Disney can slap any date on it and TH will dutifully come to its defense. The late arrival of the Dwarf's coaster makes the New Fantasyland original opening date a lie. It is actually a multi-year soft opening. Spring TBD 2014 is the actual still UNKNOWN opening date of the new land. The new princess meet and greet site was also opened way too late, but just in time for TH. September 24, 2013 at 4:05 PM · "What are your expectations for the final piece of the New Fantasyland?" Is it the final one? LOL!!! Disney is taking its motto that the park is never finished a bit too far. The New Fantasyland obviously won't be finished for a long long time. September 24, 2013 at 4:21 PM · Anon Mouse writes: "The ride is late, overdue, based on customer expectations." I Respond: But not based on any announcement by the company. Anon Mouse writes: "It WAS supposed to OPEN when the New Fantasyland was opened." Anon Mouse writes: "The late arrival of the Dwarf's coaster makes the New Fantasyland original opening date a lie." I Respond: No it doesn't. September 24, 2013 at 5:08 PM · Walt Disney World needs some more imagination, all they build is mine train coasters based on old rides. September 24, 2013 at 9:23 PM · I saw a couple of people refer to Snow White "being kicked out of Fantasyland" since the old Scary Adventures supposedly told her story but the Mine Train doesn't. I have to say -- as someone who always rode Scary Adventures and who still enjoys it at Disneyland -- that the ride never made all that much sense to me. I have enjoyed it since childhood, but it was just really scattershot and random. Originally, the ride was supposed to put you (the rider) in the role of Snow White, so it would be like YOU were her sitting there seeing the story play out...but guests got confused and wondered why Snow White was never in the ride. They didn't understand you were supposed to see the ride from her point of view and through her eyes. Then they added a few Snow Whites here and there to fix that. But the ride jumps around the story and then abruptly ends. I can't tell you how many times I rode Scary Adventures and heard people in the car ahead or behind me say "That's it?" or "Is it over?". I actually remember giggling as a small child with my parents when we heard this...and it was a game we played together for many years, every time we rode it, to see if we'd hear someone say "That's it?" or "It's over?". Personally, I think all the rides that were duplicated from Disneyland should be removed and replaced in Orlando. Let Disneyland maintain the original versions. The only reason these rides were replicated in Florida was to save money. But, enough time has passed to use that space to create new rides for Florida. Wouldn't it be great if both coasts had two different sets of rides? It would sure encourage more people to go to both coasts. I like that Snow White will be represented in California with Scary Adventures...and in Florida with the Mine Train. Oh, how I wish that Little Mermaid would have been given something different instead of a clone of the California Adventure ride...but in a way you can argue that Disneyland does not have a mermaid ride, but Magic Kingdom does...so that is different. I think Disneyland should get a Beauty and the Beast dark ride but not a Be Our Guest Restaurant. I like that Disneyland has Mr. Toad and Alice dark rides...and would like to see Magic Kingdom get a few new dark rides. Rapunzel, Princess and the Frog, and Frozen would be nice additions. I hope going forward that Disney really plays it smart (not cheap) and no longer clones. Though I wish more than anything that money could be found in the budget to redo the facades of Fantasyland's buildings so they no longer look like the tournament thing. Would love to get Disneyland's village-themed buildings. But in Orlando, make everything have French-touches on the buildings, since Cinderella's castle is supposed to be in France and should have a French village surrounding it. September 24, 2013 at 10:59 PM · Anette, I really agree with everything you just said. That is exactly why disneylands fantasyland is superior to WDWs. A unified theme, and numerous original attractions, whereas WDW is a mishmash of themes(Europe, Caribbean, circus) with cloned attractions and an emphasis on meet and greets. However I think people are going to be saying the same thing about the mine train that they said about SWSA. A 2 minute kiddie coaster that is taking years to build and opening late (or after the rest of new fantasyland), and the only original ride being opened. Oh yes I predict many people will be saying "that's it? ", but we'll have to wait and see. September 25, 2013 at 12:37 AM · TH, I am very familiar with children. Disney will do a fantastic job with this new attraction and everyone will love it. All I am suggesting is an "E-ticket" (man, I hate that moniker) needs to be compared to the most well themed and advanced rides the industry has to offer. September 25, 2013 at 7:27 AM · To give you an idea of the hype I've read on message boards that some believe this will be WDW's answer to Radiator Springs Racers. September 25, 2013 at 9:46 AM · @NB: And I am certain that Leah and Gracie and their peers may very well be of the opinion that the Dwarf Mine Train is "the most well themed and advanced ride the industry has to offer." September 28, 2013 at 10:02 AM · Seven Dwarf Mine Train looks like a lot of fun, I think that the swinging action of the "carts" will add a new element of thrills. Wish it had more dark scenes, like on Splash, so that is a disappointment, but I think it will probably be the most popular ride in the New Fantasyland, could be a fun experience at night too.